Toyota Motor Corporation (Toyota) today revealed T-HR3, the company’s third generation humanoid robot. Toyota’s latest robotics platform, designed and developed by Toyota’s Partner Robot Division, will explore new technologies for safely managing physical interactions between robots and their surroundings, as well as a new remote maneuvering system that mirrors user movements to the robot. Onboard T-HR3 and the Master Maneuvering System, motors, reduction gears and torque sensors (collectively called Torque Servo Modules) are connected to each joint. These modules communicate the operator’s movements directly to T-HR3’s 29 body parts and the Master Maneuvering System’s 16 master control systems for a smooth, synchronized user experience. The Torque Servo Module has been developed in collaboration with Tamagawa Seiki Co., Ltd. and NIDEC COPAL ELECTRONICS CORP. 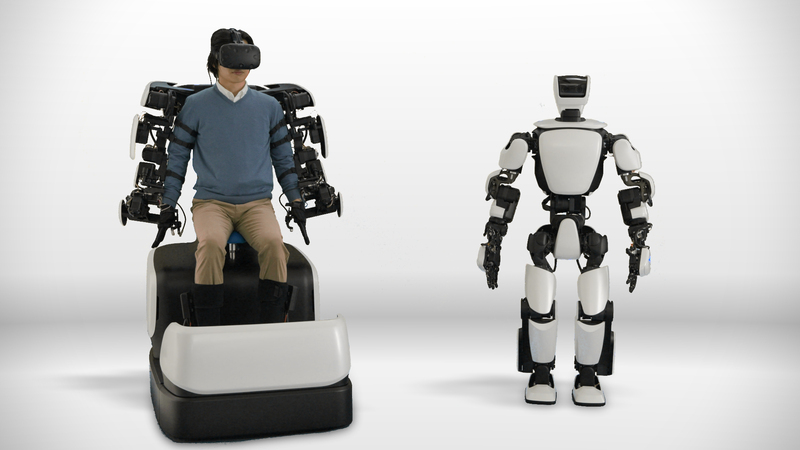 This technology advances Toyota’s research into safe robotics by measuring the force exerted by and on T-HR3 as it interacts with its environment and then conveying that information to the operator using force feedback. The Torque Servo Module enables T-HR3’s core capabilities: Flexible Joint Control, to control the force of contact the robot makes with any individuals or objects in its surrounding environment; Whole-body Coordination and Balance Control, to maintain the robot’s balance if it collides with objects in its environment; and Real Remote Maneuvering, to give users seamless and intuitive control over the robot. These functions have broad implications for future robotics research and development, especially for robots that operate in environments where they must safely and precisely interact with their surroundings. Since the 1980s, Toyota has been developing industrial robots to enhance its manufacturing processes. Partner Robot has utilized the insights from that experience and built on Toyota’s expertise in automotive technologies to develop new mobility solutions that support doctors, caregivers and patients, the elderly, and people with disabilities.